Join the Legal Lean Sigma® team in Sydney as we present a one-day White Belt certification course in Legal Lean Sigma® and Project Management. What is it? The Legal Lean Sigma Institute is hosting another of its popular "open enrollment" white belt certification courses in project management and process improvement. Join us in Chicago on November 11 for an in-depth dive into PM and PI. We combine lecture and interactive exercises to help attendees understand and then apply PM and PI concepts adapted for implementation in the law firm and law department settings. We cover a lot of ground in a short amount of time, but participants will leave with a solid understanding of both the fundamentals and how they can be applied. The white belt certification course is ideal for those who are ready, or getting ready, to embark upon a continuous improvement initiative within their organizations. It's also a great refresher for those who have had some exposure but haven't had much opportunity to engage. We held a standing-room only session earlier this year exclusively for in-house counsel, so those who were unable to join us are welcome. We've also held a number of private white belt and yellow belt certification courses for clients in the US and Canada, so this session is ideal for team members who have joined your continuous improvement initiatives but weren't at the initial training. This is also an ideal session for law firm and law department leaders who don't expect to personally dive into the details, but need to know enough about these concepts to establish a vision for continuous improvement and then supervise the effort. Of particular interest to senior leaders are the modules on understanding the economics of continuous improvement. 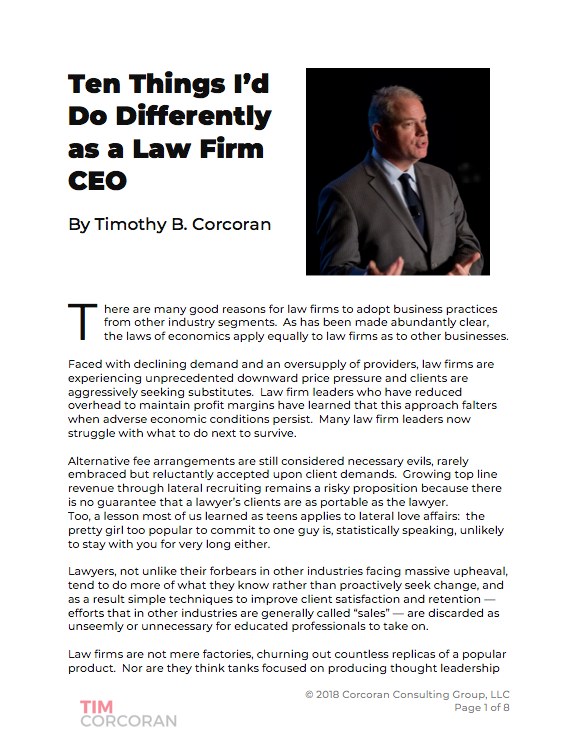 Think PM and PI are bad for law firms, because efficiency doesn't pay as well as inefficiency (even though it's not cool to say that out loud)? We'll show how law firms can generate greater profits from PM and PI while improving client satisfaction. Think your law department is too complex to "routinize" all of your legal matters? We'll show you how to better link upstream your business management's needs with your law department resources and mission. The event is produced by our friends at the Ark Group, so visit their site here to register. As of this writing, there are individual seats available and a few slots for teams.